Have you been finding moments of delight? Have you been looking for them? Delight is often right in front of us but if we aren’t paying attention for it, we miss it altogether. It’s been a a busy month and at times, I’ve had to remind myself to pay attention. Among time with family and grandchildren in May, there were many, many moments of delight. Those are precious and not as hard to be aware of. It’s those other times when it needs to be a conscious decision to look for the delight in our lives. In the spring, before the trees have leafed out fully, and after the sun has shifted to it’s spring position in the evening sky, we have these light patterns on our living room wall. It only happens for a month or so in the spring and I always enjoy it when it shows up. Unlike other parts of the world and the US, outdoor restaurant seating is not common here in central NY state. Most of the year, it’s too cold, too wet, too much work for restaurants to have outdoor seating. Many don’t bother at any time of the year but a few are willing to take that risk in the warmer months. Did I mention that I LOVE to dine outdoors? So the appearance of these tables and umbrellas is most delightful when it happens! Outdoor dining is one of my greatest delights! As the lawn begins to grow in the spring, before it’s seen the blades of the lawnmower, our front lawn is COVERED in violets. This is about one square foot of our lawn. The rest was equally and delightfully populated with wild violets. You cannot help but smile at the sea of violets. I recently discovered there are actually practical uses for all those lovely purple blossoms. Will have to try that next year. We spent some time in Switzerland visiting family and being Grandma and Grandpa in May. Lots of delightful moments there! But we also played tourist one day and took a trip up Mt. Pilatus. Coming down on the gondola, this lovely little church, Klimsenhorn Chapel, appeared on the back side of the mountain. It was so unexpected, and that is often a part of the sense of delight. Another unexpected delight, was happening upon these two men practicing their Alphorns while we were hiking on the Felsenegg Ridge above Zurich. 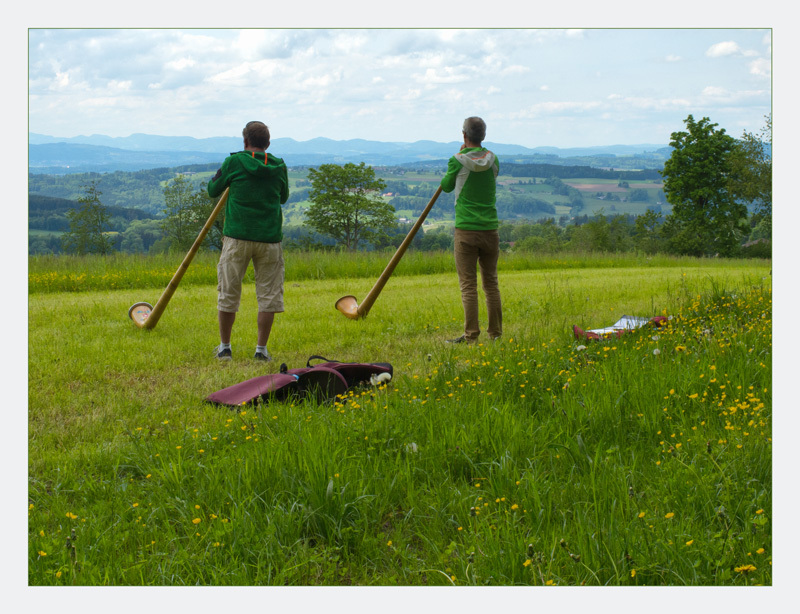 Click here to listen to Alphorn music, a decidedly Swiss experience. Seeing a blimp, or more correctly in this case a zeppelin, is always a surprise and delight. This one was floating over the Zurich area to celebrate the 20th anniversary of Edelweiss Air. Upon arriving home from our travels, the daffodils were in full bloom all over our yard. One day as I pulled out of the driveway I noticed that the neighbor children had decorated the fire hydrant sign with daffodils from our yard. I’ll admit to a brief moment of annoyance but then thought of the delight they had taken in creating this much more cheery sign. When you are gone for a few weeks in early May, the grass seems to have exploded into growth when you return. The lawn desperately needed to be cut but after my husband finished mowing, I went outside and noticed a small clump of flowers that he’d left un-cut under the oak tree. He knew I would take delight in the way they swayed in the breezes and how pretty they were. Mostly, the delight came from his gift of knowing that and leaving them for me. I discovered that these volunteers in the yard are part of the Aster family and known as Robin’s Plantain. Playing with my camera to capture these images offered more delight. Those are just a few moments when I found delight in the past weeks. What have been your moments of delight recently? Know anyone who would enjoy this post? Be nice and pass it on to them! Thanks! This entry was posted in Open to Delight and tagged Delight, Flowers, Switzerland on June 10, 2015 by gail.